These classic Halloween candy recipes chosen from Grandma's collection make candies that are wholesome and delicious. You can be sure they'll be enjoyed by trick or treaters of all ages. Back in the 1950s, when I was a youngster out for trick-or-treating, we were always running to the homes where people gave out homemade candies. 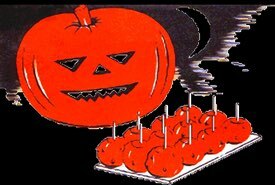 Believe me, you never forget the taste of those delicious, homemade candy apples, chewy caramels, and Halloween taffy. I still can't resist those popcorn balls! Your little goblins will love these nostalgic Halloween candies. Thanks to the old fashioned recipes that Grandma saved from the 1920s, you can easily make delicious homemade treats to enjoy at Halloween or whenever you fancy nibbling on something sweet and chewy. 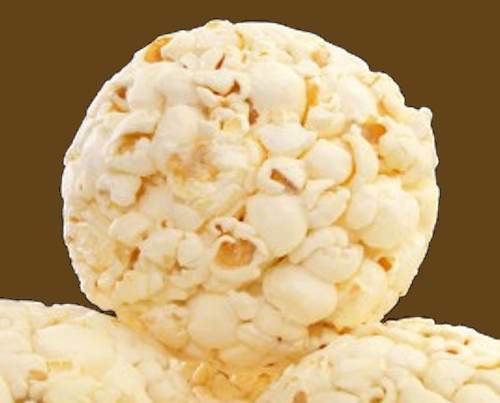 An all-time favorite Halloween candy recipe, these popcorn balls are fun to make, and they taste delicious. 1 cup sugar, 1/2 cup light corn syrup or molasses, 1 tablespoon butter, 1/4 teaspoon salt, 1 teaspoon vanilla, 1 teaspoon vinegar. Melt the butter in an enameled saucepan, add the sugar and syrup, and cook without stirring until a little dropped into cold water will crack. Remove from the heat and pour the syrup over the popcorn, which should be spread in a large pan. Pour very slowly, turning the popcorn so that the kernels will be well coated. Shape in small balls, pressing well into shape, and wrap each in waxed paper to preserve freshness. 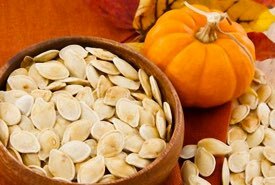 Popcorn pumpkins are very tasty and make splendid decorations for the table at a Halloween party. These pumpkins are made of popped corn. Directions: Put one quart of popped corn through the coarsest blades of the meat grinder [or blender]. Place in bowl and pour over it a syrup made by boiling together two cups of brown sugar, one-half cup water, a tablespoon butter, and a pinch of salt. Orange food coloring (1 drop red to 9 drops yellow) may be added. Cook without stirring until a little syrup dropped in cold water will form a firm ball. This taffy will hold the kernels together. Form into pumpkins keeping the corn taffy over hot water to prevent it hardening to quickly. Insert raisin on toothpick for stem. 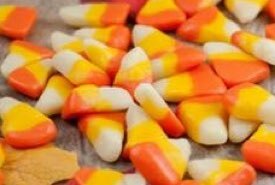 Your entire family will enjoy making this classic Halloween candy recipe. Not only will you enjoy eating the taffy, but your kids will get to experience an old fashioned taffy pull. Gather everybody in the kitchen and have some fun. 1 cup molasses, 1 cup brown sugar, 1 tablespoon vinegar, 2 teaspoons butter, 1 teaspoon [baking] soda. Mix ingredients and boil until mixture hardens when dropped in cold water, then add teaspoon soda; mix quickly and pour into buttered pans. When cool enough to handle, pull taffy and cut into sticks. Wrap in waxed paper. Put nothing on hands while pulling; keep hands cool. Nutmeats may be stirred into candy just before pouring into pans. Three tablespoons butter, one cup molasses, three-quarters cup cream, four squares unsweetened chocolate, one cup sugar, one-half teaspoon vanilla. Melt butter in a saucepan and add cream, sugar, and molasses. Bring to the boiling-point and add chocolate, balancing it on a large wooden spoon that it may melt gradually with no danger of its burning on the kettle. Continue the boiling, stirring occasionally, until a firm ball may be formed when mixture is tried in cold water, add vanilla, and turn into a buttered pan, having the mixture three-fourths inch in depth. When nearly cold, cut in cubes, using scissors, or a sharp knife. Wrap in squares of paraffin paper (waxed paper), and let stand in a cold place to harden. Two cups granulated sugar, 1/2 cup light corn syrup, 1 cup sweetened condensed milk, 1/2 cup heavy cream, 1 cup milk, 1/4 cup butter, 2 teaspoons vanilla. 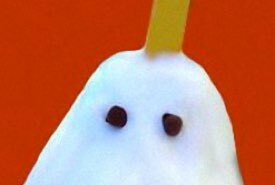 Mix together all ingredients except vanilla, and cook over a low flame, stirring constantly, until thermometer reads 246º Fahrenheit. Remove from fire, beat, add vanilla, and turn at once into a slightly greased pan. When cold, remove from pan and cut, using a large sharp knife. 1. Cook over a low flame. 2. Stir constantly. Caramels burn very easily. Seriously. 3. Wrap each caramel in waxed paper immediately. Line a 13x9 baking pan with waxed paper (this makes for an easy clean up later). Melt chocolate in double boiler with milk and butter, remove from heat. Combine nuts and marshmallows, then fold into the chocolate. Press mixture into the lined baking pan, spreading it out evenly as possible. Sprinkle the soft candy mixture generously and evenly over the top. Refrigerate until firm enough to cut into squares, then store at room temperature. Not only is this an easy Halloween candy recipe to make, it's also a versatile recipe. If you prefer, you can use another type of nut or mix in some candy pieces or a favorite dry cereal. You can even add other fun ingredients aside from those listed here. Above all, make it colorful and festive looking. 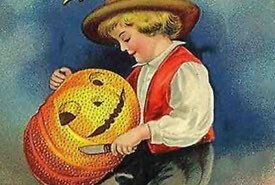 Here's how to have lots of old time Halloween fun in the kitchen this year: Let each family member choose one of the old fashioned Halloween candy recipes that they'd love to make. Or, let them choose from the dozens of other classic candy recipes featured on this site. Make homemade candy treats to fill your candy dish and have plenty left over to munch on the rest of the week. Homemade candies are delicious to eat anytime and are perfect for serving at get-togethers and parties. Halloween and trick or treating isn't the same as it was when I was a young boy in the 1950s. 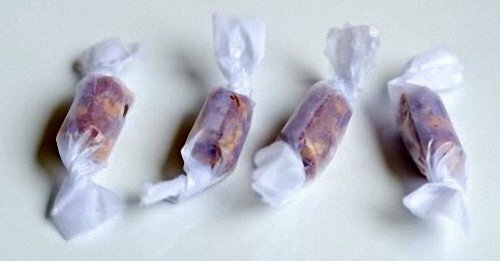 Nowadays it's best not to give your trick or treaters homemade candies at the door as most parents will simply throw them away because of safety concerns. Sadly, times have changed. Instead, plan an old fashioned Halloween party at home and invite other parents with young children to share in your homemade treats.